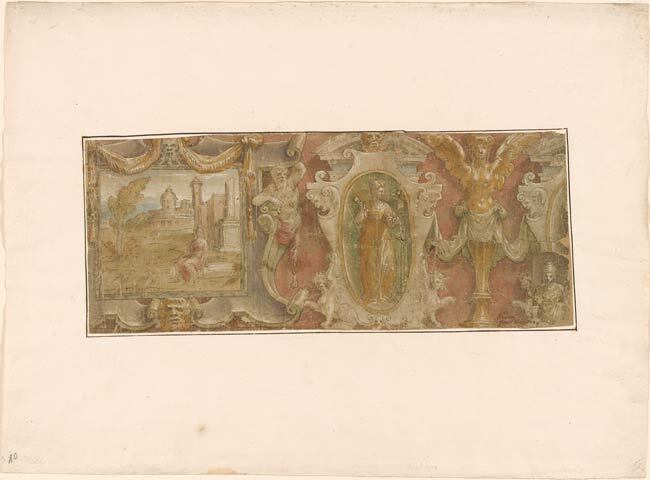 Pen and brown ink, brown wash, red, ochre, green, light blue and mauve watercolor, heightened with white gouache, on paper; small figure at lower right inserted on separate piece of paper, probably taken from far right of drawing. Inscribed at lower right, in pen and brown ink, "Andrea / [fecit (?)] / Vicentino". Moscardo collection, Verona, which passed to the Marquis de Calceolari (no mark; see Lugt S. 2990a-g); purchased in Zurich in 1949 by János Scholz, New York (no mark; see Lugt S. 2933b).